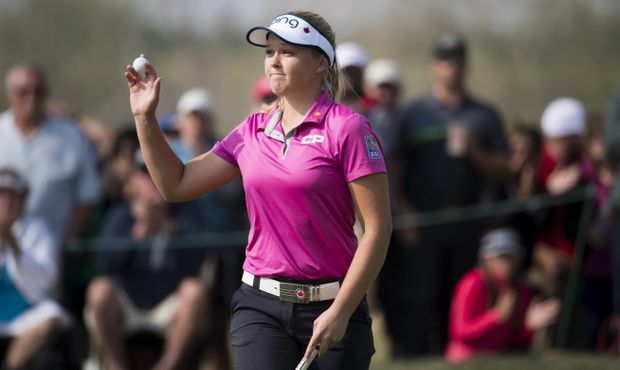 Brooke Henderson, of Smiths Falls, Ont. celebrates finishing her third round at the CP Women's Open in Regina, Saturday, August, 25, 2018. Canada’s Brooke Henderson shot a 2-under-par 70 on Saturday for a one-shot lead after three rounds of play at the CP Women’s Open. Henderson had three straight birdies on the back nine at the Wascana Country Club but bogeyed the 17th hole after missing a short putt. She had a par on the final hole to finish at 14-under 202. Japan’s Nasa Hataoka (69) and American Angel Yin (71) were tied in second place. Yin missed an eight-foot putt on her final hole that would have given her a share of the lead. Defending champion and world No. 1 Sung Hyun Park of South Korea (70) was two shots back. Australia’s Su Oh (69) and American Austin Ernst (70) were three strokes off the pace at 11-under 205. Henderson started the day one shot behind Yang, but the South Korean bogeyed her first two holes to give the Canadian the outright lead. They were joined in a group with Yin, who hovered near the top of the leaderboard for most of the day. Yin had an eagle putt on the par-5 17th but ended up settling for par. The wind was blowing again on the 6,675-yard course but it was much cooler early in the round. The sun came out and temperatures rose later in the day. On Sunday, Henderson will try to become the first Canadian since Jocelyne Bourassa to win the national championship. Bourassa won the 1973 title in Montreal. Henderson, 20, has one victory this season and six wins over her LPGA Tour career. Her best career finish at this event came last year in Ottawa with a tie for 12th. She was steady at the start on Saturday with four straight pars before a drive on the par-4 fifth hole found the rough and led to a bogey. She responded by rolling in a 12-foot birdie putt on the sixth. Henderson, from Smiths Falls, Ont., birdied Nos. 12 and 13 and nearly eagled the 14th hole. Her chip from the rough hit the back of the cup and bounced a couple inches away for a tap-in birdie. She ran into some trouble on the 16th hole but recovered nicely. Henderson pulled her drive and her second shot landed in the rough beside a greenside bunker. Standing in the sand, she flopped a wedge that came up short but she hit a 20-footer to save par. Yang, meanwhile, struggled to a 75. She was in a five-way tie for seventh place at 10-under 206. Hamilton’s Alena Sharp (70) and Anne-Catherine Tanguay (70) of Quebec City were nine shots off the lead. The final round will start early Sunday morning in an attempt to avoid the rain that’s in the forecast. Play will begin at 7 a.m. local time and the final group will start at 9:01 a.m. The winner of the US$2.25-million tournament will earn $337,500. The runner-up will pocket $209,358.